ServiceMaster Clean Contract Services Guildford is celebrating after scooping three business awards just 18 months after takeover by new owner! 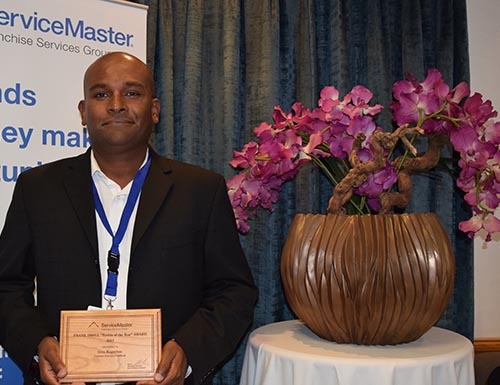 ServiceMaster Clean Guildford, is a franchise of ServiceMaster, owned and managed by Siva Kugathas for just the last 18 months, the business continues to go from strength to strength. ServiceMaster Clean Guildford provides commercial cleaning services for doctor surgeries, veterinary practices, car showrooms, sport stadiums, offices, factories and schools throughout Guildford, Woking and Farnham. Siva collected Rookie of the Year, Sales Growth and his employee Kinga Derenowska picked up Employee of the Year at the Summer Summit conference for ServiceMaster limited held in June of this year. “I chose to nominate Kinga for Employee of the Year as this year she really has gone above and beyond. Kinga started as an office admin worker and her main responsibility was doing Payroll and Accounts. She was not responsible for recruitment or any other operational duties. However, she saw that I needed help and took it upon herself to help during her own spare time. Picking up one award is an achievement, but to collect three in the first year of business is outstanding. https://www.servicemasterofficecleaning.co.uk/wp-content/uploads/2016/03/servicemaster_clean_logo_out_of_yellow.gif 0 0 Vicky Tayler https://www.servicemasterofficecleaning.co.uk/wp-content/uploads/2016/03/servicemaster_clean_logo_out_of_yellow.gif Vicky Tayler2019-02-01 16:59:112019-02-07 12:34:29ServiceMaster Clean Contract Services Guildford is celebrating after scooping three business awards just 18 months after takeover by new owner!